I recently attended a trade show and the vendor next to me sold a variety of educational toys she had developed to use in her Kindergarten classroom to help her students with their lack of fine motor skills as well as hand strength. We spoke for a while and she spoke about how over the years since tablets and "Swipe" type technology has come forward her students are coming into Kindergarten with the inability to do the simplest tasks such as cutting paper. She introduced a few items into her classroom and she's seeing great improvement and lots of praise from the 1st-grade teachers benefiting from her work with the kids. A few weeks after the conference I started to think about what she said and went on a search for items on my favorite handmade marketplace. Etsy! I wanted to spotlight a few great shops who sell educational toys and today's Vendor is Beezy Boards. As soon as I started looking at Kateryna's designs I knew I had to share! She's got great reviews and reasonable shipping costs! You can click any of the photographs to go straight to the Beezy Boards Etsy shop to view all her great items. I'm just going to share a few of my favorites here with you! 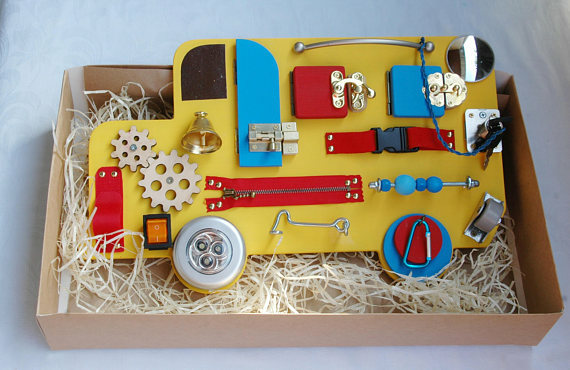 And her Felt Buckle Toys are wonderful as well! Just so cute and perfect for little ones to explore or help with people who have sensory issues or even dementia patients who are comforted by busy hands. I just loved everything about her shop and the purpose behind them so be sure to go check out her shop and show her some love and support her handmade shop!